Money Manager is a personal finance software. It primarily helps organize one's finances and keeps track of where, when and how the money goes. It is also a tool to get a bird's eye view of your financial worth. The program supports checking accounts, savings and credit card accounts, as well as Fixed Deposit and Portfolio accounts. 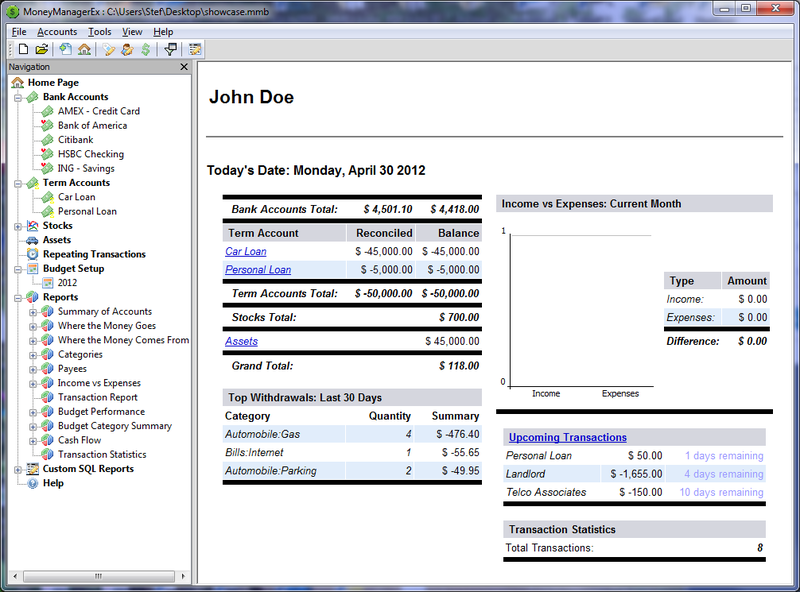 The Outlook-style interface provides an overview for all your accounts and total balance. You can transfer money between accounts, create custom categories to organize your income/expenses and more. Money Manager Ex is a complete rewrite of the original .NET Money Manager. It is Cross Platform and can be ported to run on Windows, Mac OS X and Linux. It has a very powerful and flexible open data storage using SQLite databases. Getting better and better. Now reports added too. Doesn't look like that much really changed. But then for my personal use it is perfect anyway. Just trying it and it seems a good start with a long way to go. Have been a long, long time user of Quicken and Intuit products and there HAS to be something to replace their software. They get worse and worse every year. Three stars for trying. Hoping this develops into something better. Brilliant piece of software. Probably not as capable as GnuCash. But then it was never intended to be. Nice and simple. Beats the pants off some of the cheaper comercial programs available. I just love reviews from guys like alcvanamelsvoort, its obvious they either didn't try it, or he has a messed up comp, or he works for a company that has a competing product. Money Manager is incredibly stable, it would not have gotten as far as it has it it were flaky, a lot of time and effort has gone into this application and it deserves a much better review than that. I downloaded and installed this application with high expectations. However, I've never encountered an unstable application like this one and it's no longer on my PC. For those who want a simple, reliable money manager without the bells, whistles and bloat of MS Money, MMEX rocks. Cross-platform and open source too. Strongly recommended. This is a cool app and after recently getting extremely frusterated and giving up on Quickbooks due to its clunkiness and ridiculous organization - I felt immediately thrilled with this and transferred my spreadsheets into CSV and into this. Worked great. #1) Does not periodically save backups. I just lost 1 hour of work after it crashed. #3) On Repeating Transactions, the Transaction # is not an available column, making multiple repeating transactions from the same client confusing. Otherwise, I see great promise! New version, new review. No change. A WONDERFUL alternative to Quickbooks or Quicken, especially for personal small time use like I need the program for. I never thought of keeping a tab on my personal financial situation until now. This program makes it easy, quick, and fast. Please add the ability to have graphical reports like PIE CHARTS! This is one deeply lacking feature from the program. 4 star program until graphical reports are added! just keeps getting better and better... still a few minor quirks, especially when scrolling up and down an account with lots of activities but its more than enough for my needs! I like this one so far. Light and flexible. Two things bother me. 1. entry should look more like checkbook register type. very small learning curve. 2. when trying to create JUST a savings account, you are given the option of Checking/Savings and then when chosen, it locks itself as Checking. you then have to rename it to something like "Savings Acct:" or whatever floats your boat so that you can see it in the tree list that it's a savings account. Fix those things and you can totally replace Money/Quicken!